These guidelines are just that, guidelines. They are not meant to be all inclusive but they are meant to set the outside perimeter of what should be expected. By discussing these issues prior to marriage, you will find more peace and less anxiety about your partner’s sexual behavior. Proverbs 31:1. King Solomon opens the chapter by recalling instructions that were given to him at a younger age by his mother. These verses are meant not for women to follow but rather for young men who are dating and looking to find a wife. It is an older woman’s reflection and advice given to her son on the type of woman who is good to marry well before he becomes King. Proverbs 31:2. The close relationship between Solomon and his mother is seen in these passages as she identifies him as her dearly loved son whom she devoted to God. This further indicates that the name “Lemuel” is not a real name but rather one that is a familiar name only known to Solomon and his parents. Proverbs 31:3. Bathsheba’s opening plea is simple, “do not waste your strength on women, on those who ruin kings”. Solomon’s time, energy and effort have been sorely misplaced and she is begging him to choose a different path. Looking back at David’s life and the many wives he had including Bathsheba, it is possible that she is begging Solomon not to follow in his father’s footsteps when it comes to the type of women he marries. Proverbs 31:4-7. The son, Solomon, is a partier. He goes out, gets drunk, and hangs out with the wrong crowd. The problem is that he is destined to become King and his behavior is not fitting for a King. This advice is clearly given by his concerned mother before Solomon becomes King and before he is married. His partying behavior could also be seen as a continuation of the troubles that David faced with his sons as a result of the adultery with Bathsheba. Clearly Solomon was not aware that his half-brother was making a move to take the Kingdom over or he would have been the one pleading with his father instead of his mother (1 Kings 1:5-53). Proverbs 31:8-9. These verses paint a very different picture of what Bathsheba believes is appropriate behavior for a young King. She is contrasting his current behavior with what it could be and perhaps is reminding him of his own vision of the Kingdom, his desire to reign well, and his full potential as the future King. It is not unusual for a mother to see the best in their child and want them to accomplish all that they are capable of becoming; this is Bathsheba’s hope for her son. Proverbs 31:10-31. Bathsheba’s advice to Solomon was not about a woman as she appears today, but rather what is able to become in the future. She is painting a picture of the ideal wife at the prime of her life that is direct contrast to the parting women Solomon was hanging around. In her subtle way, she is also painting a picture of how to treat a wife, how to be a good husband, and how to lead. Proverbs 31:10. This verse indicates that finding a good woman is hard and requires some searching. The type of women around Solomon were most likely not hard to find, rather they were easy to come by. In addition, their mothers’ most likely partook in the gossip mill that destroyed Bathsheba’s reputation, further adding insult to injury. Proverbs 31:11-12. This information then explains the next two verses reminding Solomon how quickly a man’s reputation can be destroyed by one bad mistake. A lesson that was not lost on his mother. All of her motherly instincts would be to protect her son from the same pitfalls as her husband and herself, so she pleads with him to behave differently. Talk about love. To be able to look back at your life and see where your actions and behavior caused damage to someone you love takes strength and courage. To take the next step and beg your son not to marry someone like your former self requires humility. These verses are spoken with deep regret for her part in the adultery and a desire for her son Solomon to have a better life. Solomon, as the author of these verses, must have looked back on his own life regretting that he did not heed his mother’s advice. He did not take the time to search for one wife; rather he married anyone and everyone whom he desired. Proverbs 31:13, 19, 21, 22, 24. Bathsheba describes a woman who is a seamstress by trade. She buys wool and flax (31:13), spins it into thread (31:19), turns it into beautiful garments for herself (31:22), into clothing for her family (31:21), into bedspreads (31:22) and finally into garments that she sells to others (31:24). It is not likely that Bathsheba would be a seamstress nor that she would be selling things to others. So these verses are about someone else. It could have been her mother or grandmother or it could have been someone who sold merchandise to her family. Whoever it was, it was a woman who Bathsheba respected and idealized. A woman she would have been close enough to know all of the work that goes into making a garment, for she did not miss a step and is very specific about the details. Proverbs 31: 16, 18. The earnings earned by the woman Bathsheba describes she uses to purchase land and turn it into a vineyard (31:16) but this was not her primary business as the details are much less specific. However, she does not keep a business that isn’t profitable (31:18) and works hard to ensure that her businesses are successful (31:18). Again, this is not behavior fitting the future Queen mother but is most likely someone close to Bathsheba because of the very personal information she knows about this woman. Proverbs 31:18. The woman described is also not a young woman but married with two successful small businesses, children and a household large enough for servants. Clearly, Bathsheba is not recommending that Solomon marry her at this point in her life but rather look for a woman with similar aspirations for the future. It is also the portrait of a wealthy woman but not one who inherited the wealth or married into wealth but one who earned it. Instead it is a woman who contributes greatly to the finances of her household. Proverbs 31:14-15, 21, 26-27. The woman also takes care of her household servants by feeding them, providing for them, instructing them, being kind to them, and respecting them. She is not rude or belittling to her staff but rather knows how to lead without being harsh. She doesn’t hoard her position of authority over them and is a good example of a servant leader. Bathsheba, having received such harsh treatment by others, could be talking about herself in these verses. She would have been much more compassionate with the pitfalls and short-comings of others after she experienced the very public disgrace. Proverbs 31:20. The woman’s generosity extends to those outside her household as she freely gives to those in need. This too could be Bathsheba talking about herself as the needy have no reason to reject a helping hand from someone with a poor reputation. Proverbs 31:17, 25-26, 30. 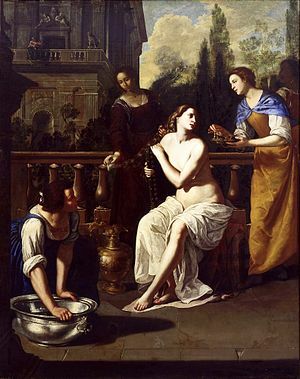 The character of Bathsheba’s woman is described as energetic, strong, hard-worker, dignified, fearless, wise, and kind. She is not lazy, passive, fearful, foolish, harsh, or weak. Such women would have easily described the partiers that Solomon was hanging around and the exact type of women that Bathsheba did not want him to enmesh with for the rest of his life. Sadly, this is exactly the mistake that he did make. Proverbs 31:28-29, 31. The woman mentioned is praised by her husband, her household, her community, and her children. This is a tall order to be praised by so many areas and can only be accomplished after a lifetime of achievement. Bathsheba did not achieve this and her desire for her son to do better is powerful. Solomon who sees at the end that he did not heed his mother’s advice, now during his reign as King sees the value in it and implores others to listen. Proverbs 31:11, 23, 28-29. Only four verses reference the husband of Bathsheba’s woman. He trusts his wife because she adds value to their lives, he is well liked in the community, has a position of authority, is willing to give his wife the recognition that she deserves and clearly adores his wife. Based on how David treated Bathsheba at the end of his life by giving the throne as promised to Solomon, it is possible that she is describing him. A true love story to the end, with a very rocky beginning, Bathsheba’s wish was for her son to treat his wife as well as she was treated.